Whether you are trying to shed a few pounds or gain some muscle mass, having a reliable and accurate scale is a must. But, with weight loss being a billion dollar per year business, the market is flooded with choices for every product under the sun, especially something as basic and necessary as a scale. This review will focus on Health o Meter’s professional grade scale, the 349KLX. The pros, the cons, and what every consumer needs to know before spending their hard-earned cash on this device. 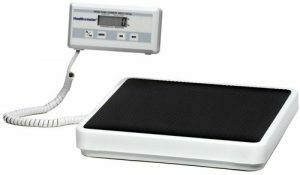 The model 349KLX is a professional grade medical scale. This means that it is held to a higher degree of accuracy than other, more inexpensive, bathroom scales. Health o Meter is the most successful brand of medical scales on the market today, and they make everything from bargain-priced bathroom scales to lab-quality scales that run thousands of dollars. This model of scale is about as high quality as you can find for its price range, which is $200-300. This scale has a smaller footprint than many other professional grade scales. This is perfect for someone who wants an accurate scale which is also convenient to have around the house. The weighing platform measures 12.5 inches by 12 inches, which is small enough to fit in most bathrooms, while large enough so that even larger consumers can feel secure when they step on the scale. Attached to the weighing platform is the device’s display. Unlike many bathroom scales, there is no having to bend over or strain to see this digital display. Connected with a 9-foot cord, the display can be placed wherever is most convenient. Some consumers prefer mounting it to a wall at eye level, while others place it on a nearby table or countertop. You will always be able to see the readout, regardless of your mobility or flexibility. This is a major advantage that this scale has, especially for the elderly, arthritic, or otherwise disabled consumer. If you have or plan on buying a vital signs monitor, the 349KLX can communicate directly with the Spot Vital Signs Lxi models by Welch Allyn. This will give the most complete picture of your health available outside of a doctor’s office. The 349KLX can be powered by either a 9-volt battery or with an optional AC adapter (ADPT40). It does not use much power, so the battery should last quite a while, even with everyday use. Unlike many bathroom scales which top out between 275-330 lbs, this scale has a 400 lb (180kg) weight capacity. The heavy steel base is rock solid, and will not break under heavier weights. Most consumers who have bought this scale seem pleased with their purchase, with 93 percent of Amazon customers rating it 4 or 5 stars (out of 5). It seems to be popular both as an in-home scale and also for use in support groups and other semi-professional/group capacities. Many users report that the scale accurately reported their weight when checked before or after a doctor’s appointment, matching the weight given by the scale at the office. One of the more divisive features of the scale is its separate digital display. While most consumers liked the ability to customize the location of the readout, some found it difficult to read if not mounted on a wall. This could pose a problem if you plan on moving the scale frequently or need to be flexible in where it is used. One person was also unhappy with the metal mounting bracket and recommends using a strip of velcro to allow the display to be both mounted on a wall and removable. However, most reported that the inconvenience was minor, and they were otherwise satisfied with the product. Even with the few complaints, nearly every consumer has been happy with their selection. A few people reported receiving broken units, however, this would be covered by the product’s warranty. The Health o Meter 349KLX Digital Medical Scale is a professional quality product at a consumer-friendly price. With ample features and high accuracy, this scale is perfect for anyone who is monitoring their weight and needs a scale that is reliable and accurate.